Express yourself with your collectibles! Mymojis are some of your favorite characters as 1 1/2-inch emoji mini-figures! Each mini-figure in randomly blind-bagged and includes a free digital download code for a Mymoji emoticon. 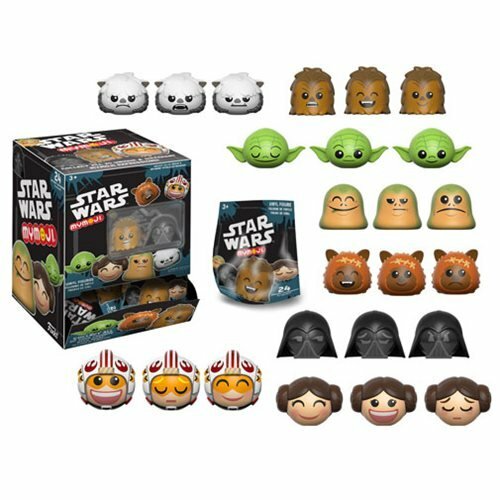 The Star Wars Series 1 Mymoji Mini-Figure Random 4-Pack includes 4 randomly selected blind bagged mini-figures. Ages 3 and up. Please note: Item selection is random. Items are in blind packaging. We cannot accept requests for specific items, nor can we accept returns on opened items. You may receive duplicates. Please note: This item may have variants randomly inserted throughout the production run. We cannot accept requests for specific variants, nor can we accept returns on opened items. The item you receive may be different from the one pictured. Breakdown not available at this time.